Moreover, for children with asthma, it is particularly important that both the patient and the caregiver are educated to follow a home-treatment plan. This approach provides the greatest opportunity to promote compliance with the treatment plan, control of asthma and treatment of exacerbations in a safe and timely manner, and therefore, we meassure how frequently we provide patients and caregivers with an Asthma Home Management Plan of Care. The National Asthma Education and Prevention Program (NAEPP) of the National Heart, Lung and Blood Institute (NHLBI), and the American Academy of Pediatrics (AAP), recommend the use of asthma reliever medications in children to effectively gain control of asthma attacks and reduce severity as quickly as possible. In accordance with the guidelines, all patients hospitalized at UCSF Benioff Children's Hospital Oakland with a primary diagnosis of asthma should receive reliever medications. The medical records of all patients hospitalized with asthma are reviewed to determine the number of patients who received reliever medication while in the hospital. We consistently achieve our goal of 100% compliance with prescribing reliever medication to patients hospitalized for asthma. Asthma is a top quality priority. 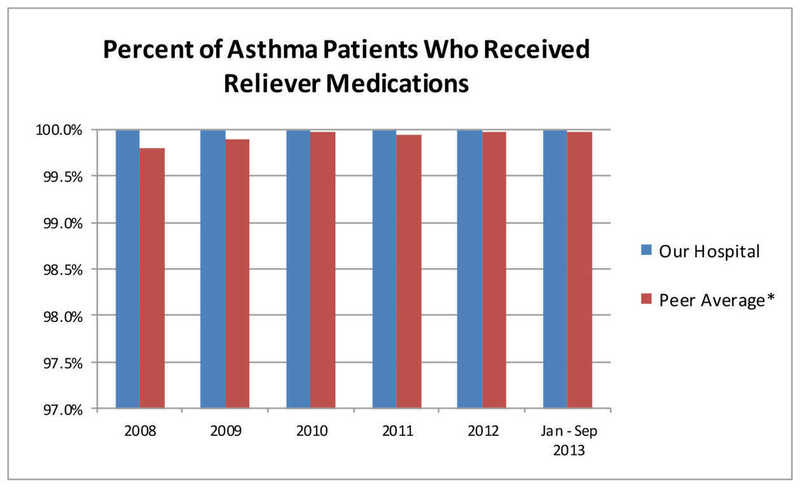 We continue to insure consistent use of reliever medication for our patients. The National Asthma Education and Prevention Program (NAEPP) of the National Heart, Lung and Blood Institute (NHLBI), and the American Academy of Pediatrics (AAP), recommend the use of corticosteroid medication to effectively gain control of asthma attacks and reduce severity as quickly as possible. With few approved exceptions, patients hospitalized at UCSF Benioff Children's Hospital Oakland with a primary diagnosis of asthma should receive corticosteroid medications. The medical records of all patients hospitalized for treatment of asthma are reviewed to determine the number who received corticosteroid medication while in the hospital. We consistently achieve our goal of 100% compliance with prescribing corticosteroid medication to patients hospitalized for asthma. Asthma is a top quality priority. 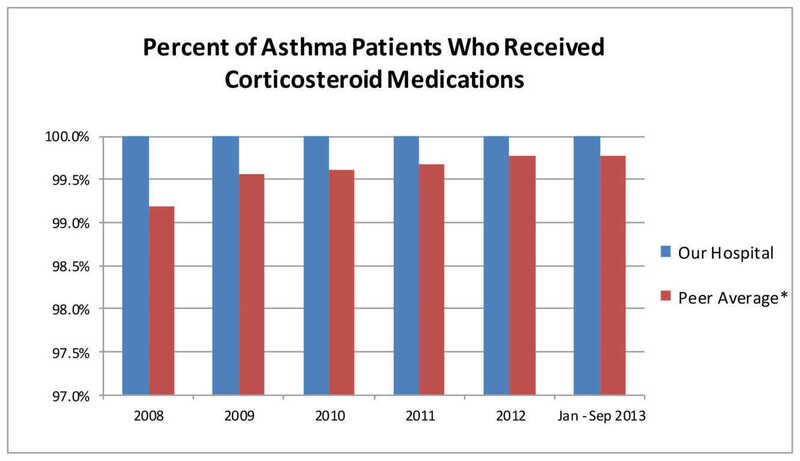 We continue to insure consistent use of corticosteroid medication for our patients. The National Asthma Education and Prevention Program and the American Academy of Pediatrics have recommended establishing a plan for maintaining control of asthma when at home. All patients hospitalized at UCSF Benioff Children's Hospital Oakland with a primary diagnosis of asthma should receive an Asthma Home Management Plan of Care. The medical records of all patients hospitalized with asthma are reviewed to determine that there is documentation of a fully completed Home Management Plan of Care. 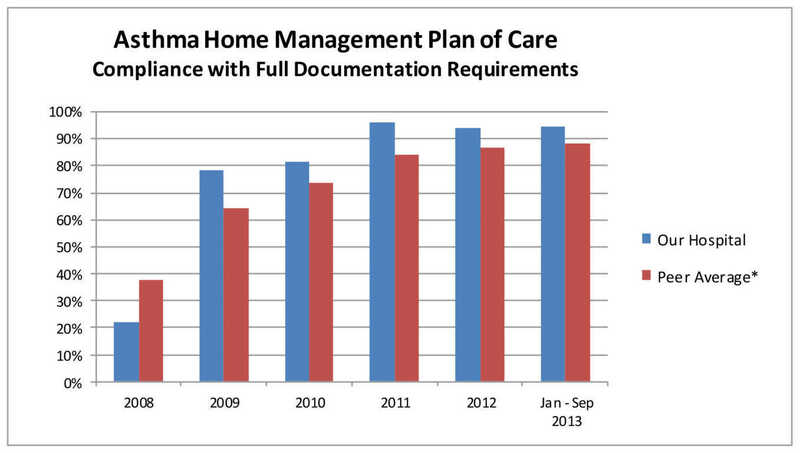 While we consistently provide Home Management Plans of Care to our asthma patients, strict adherence to the documentation requirements has not been well met in the past. Recent focused efforts have resulted in a significant improvement in compliance. Since asthma is a top quality priority, we will continue to insure consistent documentation of the Home Management Plan of Care until we reach our goal.